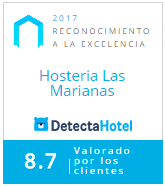 Mariana is a cozy hotel just four blocks from the Bariloche Civic Center. The skiers, hikers, cyclists and adventurers define it as the perfect urban retreat. The day starts with brainstorming ideas over the map. The owners serve a warm and healthy breakfast, fruit, eggs, cereal, bread, cakes and jams made by Mariana, amidst suggestions for daily outings in the area. Las Marianas has been hosting travelers for over a decade with unmatched friendly attention founded on quality and simplicity.